The Icelandic nation has a long and rich history of storytelling. Throughout centuries characterized by hardship, poverty and dark winters, the Icelanders kept their spirits high and moral values intact by telling each other stories. 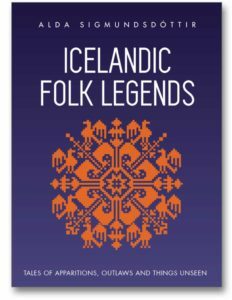 In this collection of 15 Icelandic folk legends, we get a glimpse of the world-view of the Icelanders in centuries past as they endeavored to understand and cope with the natural phenomena around them. There are stories of malicious ghosts, outlaws living in carved-out boulders, hidden people residing in grassy knolls, trolls that are tripped up by their own stupidity, and much more. In addition, there is one story exemplifying a fairy tale motif that scholars have discovered to be unique to Iceland: that of the good stepmother (The Story of Himinbjörg). Throughout we get a powerful sense of the Icelanders’ beliefs, values and fears, as well as their strong need to cling to all that was pure and good. After I read “The Little Book of the Icelanders” & “The Little Book of the Icelanders in the Old Days” I was convinced of the wonderful writing skills of the author, so I also bought this book about the “Icelandic Folk Legends”. In return I got a wonderful trip through Icelandic culture and I was able to link some myths to places I visited which made the reading even more enjoyable. I highly recommend this book to everyone who is interested in some historical background about Iceland or just wants to be carried away by these well written folk tales. – Annelies B. Short, sweet and packed with good stories. If you’ve read about Iceland, traveled to Iceland, or know anyone from Iceland, the legends in this book are totally unique. Best of all, the author gives a brief analysis of the stories explains the historical and cultural context. Totally unlike Grimm’s fairytales and those of the European continent, Iceland’s literature is a gem. – Helen B.F.